1 Preheat the oven to 200°C, gas mark 6. Put the squash, milk, garlic and 1 tsp sage into a large saucepan, season, cover and bring to the boil. Simmer for 15 minutes or until the squash is tender. Meanwhile, in a separate pan, boil the macaroni in salted water for 7 minutes, then drain. sage. Bring this sauce up to a simmer, then season if required. 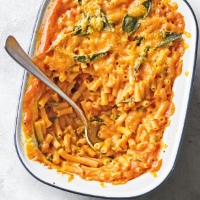 3 Stir the macaroni into the sauce and tip into a large ovenproof dish. Scatter with whole sage leaves and a little more cheese. Bake for 10 minutes or until golden and bubbling. You can make this in advance, but do not bake. Simply leave to cool, then cover and chill until needed. Reheat in a medium oven until piping hot throughout, bubbling and golden, then serve. This recipe was first published in Thu Oct 05 10:30:58 BST 2017.